Amazon acquires Audible – makes for interesting possibilities? Don’t know about you, but I think this is huge news. The largest online bookseller (actually, it’s the largest online retailer, not just books, but hey, bear with me) acquires the largest audiobooks provider. This is interesting because it’s another step Amazon is taking towards digital media, and this in light of their recent foray into the ebooks realm with their Kindle. Amazon is now poised to offer the largest collection of books, be it the dead tree version, or the digital version, and now, the spoken word version. The Kindle now has the potential to become very interesting indeed, with the possibility of now delivering audiobooks off the net, and playing it directly. Well, apparently it doesn’t yet offer direct audiobooks download via their Whispernet (requiring users to download it to a PC first, then transfer it to the Kindle) but you can bet your bottom dollar that’s gonna happen sooner or later. Imagine it – you want a book or even an audiobook? Whip out your Kindle, search the Amazon catalogue, download it immediately and voila! (Near-)Instant gratification. This is exciting as hell, because this is the future. My ideal digital reading scenario is not here yet, but this is a step in the right direction. There’s only one thing I’m worried about, which is the potential for blocking the sale of audiobooks to countries outside of the US, like what they are currently doing for their Kindle ebooks. This would be a step backwards, because I have purchased books from Audible before without issues. Having said that, Audible do have audiobooks with explicit restrictions barring them from being sold to customers from certain countries. The Audible helpdesk once explained to me that this is due to publisher rights, and some publishers have legal restrictions from selling their books outside their jurisdiction, and passes along this restriction to Audible. So. Let’s see what Amazon does with this. I’m curious and in for the ride. Sci-Fi the Last Bastion of Philosophical Writing? Really? I guess I can understand the sentiment. Readers of sci-fi almost always have homework while reading – trying to mirror the themes, environments, issues and plotlines to whatever is happening (or has happened) in the Real World. Sci-fi typically doesn’t stand alone, it has its roots in our world, and consciousness. Readers therefore enjoy a great deal more if they are able to recognize what it is about an SF novel that mirrors our world, and ultimately what message it may have. So reading contemporary fiction removes that layer of abstraction for us. And Clive Thompson’s point in his article Why Sci-Fi Is the Last Bastion of Philosophical Writing simply states that contemporary fiction has run out of ‘juice’ for interesting fruits for thought. But is it really? Is scifi really the ‘last bastion’, and not merely a common journalistic inclination towards hyperbole? My thoughts: not by a long shot. Surely ideas are not exclusive to scifi? Scifi takes a philosophical question down one path, while contemporary fiction takes it down another. If you want to show the consequences of global conflict, for example, does a scifi book painting a post-apocalyptic future have more impact than an account of a little girl scrambling for cover in the middle of a shell attack in Lebanon? Take the gender equality for another instance, which is more ‘philosophical’: a scifi book about a utopian society or a story about the insidious machinations of opponents of women’s suffrage? Just because scifi extrapolates doesn’t mean has a stranglehold on philosophy. The article is still an interesting read. One thing irks me, though. The writer included Susanna Clarke as a ‘genre-bending’ author. If you’ve not read Jonathan Strange and Mr Norrell, go do it, enjoy it, and come back and tell me what’s so genre-bending about it. Because it’s pretty straightforward to me what it was. Eos, the HarperCollins’s imprint for scifi and fantasy is celebrating it’s 10th anniversary, and is giving away a free ebook every 2 months for the rest of 2008. It’s first offering is Hobb’s Shaman’s Crossing, which is available for Mobi, Acrobot and Microsoft Reader formats. This is very similar to a Microsoft Reader initiative many years ago, where they offered two free ebooks of excellent variety every week for a period of time. That time it was to jumpstart the ebook market. This time, Eos is simply content to share the joy. Not too impressed with Hobb’s Assassin Trilogy, despite George RR Martin’s glowing endorsements, but hey, Shaman’s Crossing is free, so why not? Who knows, I may like this new trilogy, and buy the rest of the books. Of late one thing that crosses my mind whenever I scan the papers for movie screenings – plenty of them are book adaptations. Sure, this isn’t a new phenomenon, but you have to be amazed at the rate beloved books are being translated to the screen lately. I Am Legend. Atonement. Beowulf. No Country for Old Men. Stardust. The Golden Compass. PS I Love You. Bourne Ultimatum. Love in the Time of Cholera. The Jane Austen Book Club. Can’t remember the last time such a rash of book adaptations arriving so close to each other. I love it when books I have an interest in gets Hollywood’s attention. I like the feeling of finding out how others have imagined the same scenes and characters that I have envisioned in my head. I like to be enraptured all over again by the story, to nitpick, to admire, to have the opportunity to experience a great story again in a different form. 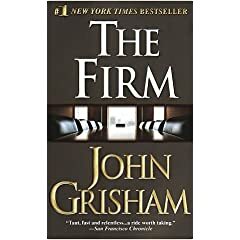 I remember my first novel-brought-to-life movie, The Firm , based off of John Grisham’s novel of the same name. It probably wasn’t the first one, really, but that’s as far as my memory takes me. I remember distinctly being disappointed with the movie, as the film took the edge off the ending, and made it reconciliatory. It stank like a skunk in the living room. 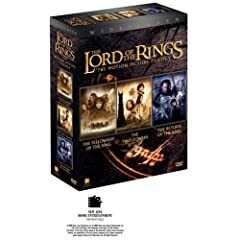 I also remember being quite thrilled at the announcement that The Lord of The Rings was being moved to the big screen, the disappointment when I learnt Elijah Wood, Liv Tyler and Cate Blanchett was cast, the anticipation, and the relief of being proven wrong with the cast, and the satisfied purr at the end result. So yeah. I love to read the books before going to see the film. That’s why the recent rush has been a great motivator for me to go back and pick up the books before I go and see them. Here are some of the more interesting ones for me. 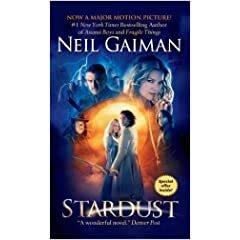 I’ve always been a Neil Gaiman fan, and I have long thought that his works were overdue for the silver screen translation. Stardust boasts an A-list cast, and promises a wonderful story. I’ve the book sitting on my shelf for years now, so this is as good a time as any to pick it up – and it’s a short book too. I loved American Gods, and I think when that gets translated I’ll be excited as a bookworm in the Library of Congress. Another fantasy book adaptation, and franchise to boot, The Golden Compass looks all dressed up for success. Philip Pullman’s His Dark Materials trilogy has been acclaimed for years, but I’ve still not gotten around to them. Looking forward to reading the first book (I recently completed purchasing the trilogy), and having Nicole Kidman playing the part in my head. Ah, a Cormac McCarthy no less. No Country for Old Men has been getting very good reviews from book pals, and I was surprised to learn that it was made into a movie. Of all the movies listed here, I think I’m most curious about this one. My copy of No Country has been sitting on my shelf for close to a year already, so this is as good a time as any to dip in. I actually shopped for a copy of Beowulf when I found out it was made into a movie (rather belatedly, I must add, and in the most unusual manner – I saw it in a computer game ad). I remember previously that the prose was too tough to get into, but then found an edition that was more my level (not the book I linked to). A whale of a story – monster terrorizes village, guy whacks monster, monster’s mother gets with the guy (insert loud exclamation here)… it’s a mess! But apparently it’s fodder enough to get Angelina Jolie. I wasn’t sure I could stand watching Jolie pout in an action flick, so I’m doubly unsure if I had to watch a CGI Jolie pout. 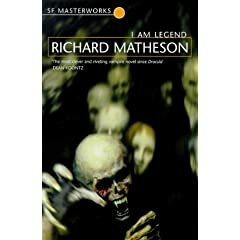 This book just happens to be one of my favourite horror stories of all time, and the only one that I’ve read was able to set my pulse rate slightly higher than I’m normally accustomed to while sitting in a comfortable chair reading. I was overjoyed to hear it was being made into a movie. But my triumphant fist pumping stopped in midair when I next found out that it was helmed by none other than Will Smith! Imagine going to your favourite sushi restaurant and finding out they have substituted the unagi with fish fillets. Sorry, I like Will enough, but I Am Legend is too much of a legend for this chap to handle.. But perhaps I’m wrong, you say! Perhaps my intuition is as crappy as watching Barney rolling around in mud, and perhaps Smith would be as great as Elijah Woods was in LOTR despite my reservations! Another big name translation. Big name for those who follow the literature scene, that is. 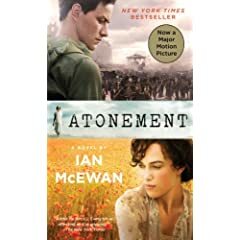 Atonement is purportedly one of McEwan’s best books. I don’t have Atonement, unfortunately, but I have Saturday. I’ve read neither, and I suppose I will buy and read it first before watching it. 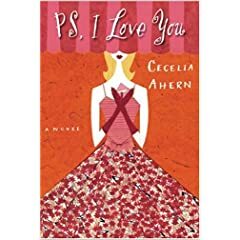 Cecelia Ahern is an impressive young woman. Most would not be able to nurture a successful writing career behind the shadow of towering parent, especially if the parent in question is the Prime Minister of a nation. But she did, and managed in many respects to become more famous than her father (because you wouldn’t be able to name the Irish Taoiseach if I asked you, but you’d fall over yourself telling me the name of the author for PS I Love You ). Now I didn’t read this book, but my wife did, and if I remember correctly she liked it. So there, my list. It’s not exhaustive, I know. But already it has motivated me to pick myself up and read. And that’s good. Why aren’t ebook readers sold here? I had planned to write a dazzling defense of ebooks for years now, but had never had the chance to really sit down to get it done (I know exactly how long I’ve been meaning to do it because I keep track of almost everything in my organizer). I’ll get to it, as I’ve picked up the writing again recently, what with the recent surge of interest in debating about ebooks with the release of Amazon’s Kindle. I’ll post my thoughts on ebooks readers later, but a quick sideswipe is I think the Sony Reader looks much better than the Kindle, although feature-wise it does lose out to Amazon’s device. I’ll get to them later. But most of all, I’m just wondering why ebook readers are not really sold here. Ever since the Rocket e-Book Reader was announced oh-so-long ago, I’ve been pining for one, but being in an out-of-the-way country does hinder shipping and handling. I want to see it in a store. I want to hold it, be impressed, be blown out of the water, be simply mesmerized by the physical presence. I can order it online, but then there’s this agonizing wait, and the hope that the shipping doesn’t shatter the precious cargo. Then of course there’s the issue of being able to buy ebooks for these devices from outside of the States. I’ve not hopped over to Amazon yet, but like iTunes Store, the Sony eBook Store doesn’t cater to us over here. This is like opening a can of worms, I had intended only to write a little, but here I am being compelled to ensure there’s no confusion on the technologies. I must clarify that for these dedicated ebook readers, the users are typically forced to go to the respective vendor’s ebook stores to purchase their ebooks, which is in a proprietary format that will only play on that particular device (i.e. Kindle only reads ebooks purchased from Amazon’s ebook store, Sony’s only from their store, and they are *not* interchangeable). For generic ebook reader software, however, such as those which can be installed on devices such as PDAs (for example Microsoft Reader, Palm Reader or Acrobat Reader), then the ebooks may be purchased from any vendor that peddles in these respective formats. This is precisely the reason that if you purchase a Sony Reader here, you’ll have problems getting ebooks because the Sony eBook Store, which is your sole avenue for ebook purchasing, doesn’t sell to those outside of the States. As it stands right now, I’m pretty satisfied with my current ebook reader, my Dopod 838Pro aka HTC TyTN. It’s small, and I carry dozens of books with me as long as I have my mobile. It’s not ideal, but it’ll do for now. I’ll be back with the whole ebook mess.